Sega is leaving in as much as it can in Yakuza 4, but says that there isn't time to leave in everything. Getting parts cut off you is something of an occupational hazard for the Yakuza, and that applies whether you're a member, or just a videogame based on the organization. After raising the ire of a number of fans with the cuts in Yakuza 3, Sega is keen to reassure them that its successor has lost the end of a pinky, at most, rather than a whole hand. Sega's Aaron Webber said that the hostess bars and mahjong games that had been excised from Yakuza 3 would survive intact in Yakuza 4. He also said that as far as he was aware, the sidequests had all been left in, and the only thing that definitely had been cut was the Japanese trivia quiz Answer X Answer. A similar quiz was cut from Yakuza 3 because it was considered to be too esoteric and exotic for Western gamers, but the reason behind Yakuza 4's cut was slightly more pragmatic. 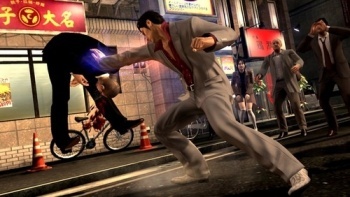 Webber said that the quiz relied heavily on Japanese text in a custom animated font, and converting it all into English would simply take too much time, meaning that Yakuza 4 would miss its Spring 2011 release date. Webber argued that it was better for the game to be cut and for the Eastern and Western releases of the Yakuza games to get closer to each other - Yakuza 4 was released in Japan in March - then to allow them to remain so far apart. Part of what appeals to many Yakuza fans is getting to roam around the streets of Tokyo and knowing that it's as about as authentic as you can get without actually going there, so the more that gets kept in the better. Yakuza 4 will be released for PlayStation 3 next Spring.